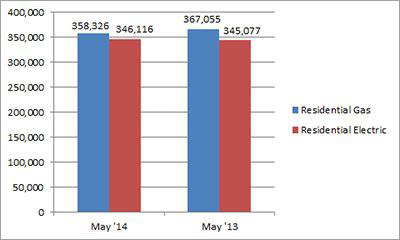 U.S. shipments of residential gas storage water heaters for May 2014 decreased 2.4 percent, to 358,326 units, down from 367,055 units shipped in May 2013. 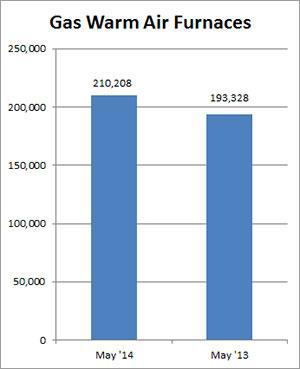 Residential electric storage water heater shipments increased 0.3 percent in May 2014, to 346,116 units, up from 345,077 units shipped in May 2013. For the year-to-date, U.S. shipments of residential gas storage water heaters increased 2.6 percent, to 1,921,781, compared to 1,872,506 units shipped during the same period in 2013. Residential electric storage water heater shipments increased 4.2 percent year-to-date, to 1,818,166 units, compared to 1,744,951 units shipped during the same period in 2013. Commercial gas storage water heater shipments increased 9.0 percent in May 2014, to 8,045 units, up from 7,382 units shipped in May 2013. 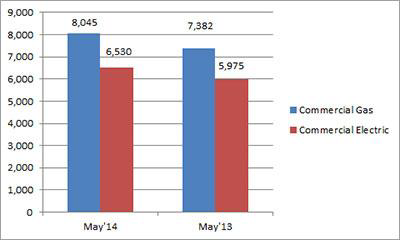 Commercial electric storage water heater shipments increased 9.3 percent in May 2014, to 6,530 units, up from 5,975 units shipped in May 2013. Year-to-date U.S. shipments of commercial gas storage water heaters increased 4.6 percent, to 41,602 units, compared with 39,778 units shipped during the same period in 2013. Year-to-date commercial electric storage water heater shipments increased 11.9 percent to 31,265 units, up from 27,932 units shipped during the same period in 2013. 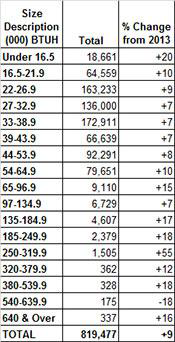 U.S. shipments of gas warm air furnaces for May 2014 increased 8.7 percent, to 210,208 units, up from 193,328 units shipped in May 2013. 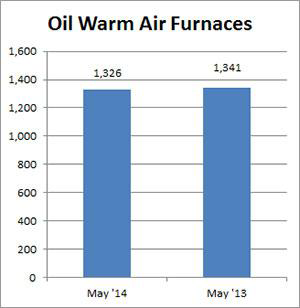 Oil warm air furnace shipments decreased 1.1 percent, to 1,326 units in May 2014, down from 1,341 units shipped in May 2013. Year-to-date U.S. shipments of gas warm air furnaces increased 7.4 percent, to 993,559 units, compared with 925,001 units shipped during the same period in 2013. Year-to-date U.S. shipments of oil warm air furnaces increased 9.2 percent to 10,673, compared with 9,773 units shipped during the same period in 2013. 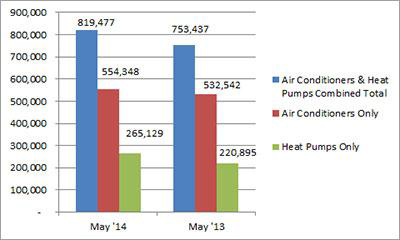 U.S. shipments of central air conditioners and air-source heat pumps totaled 819,477 units in May 2014, up 8.8 percent from 753,437 units shipped in May 2013. 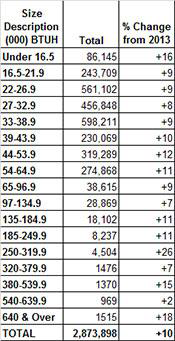 U.S. shipments of air conditioners increased 4.1 percent, to 554,348 units, up from 532,542 units shipped in May 2013. U.S. shipments of air-source heat pumps increased 20.0 percent, to 265,129 units, up from 220,895 units shipped in May 2013. Year-to-date combined shipments of central air conditioners and air-source heat pumps increased 9.9 percent, to 2,873,898 units, up from 2,614,871 units shipped in May 2013. Year- to-date shipments of central air conditioners increased 6.3 percent, to 1,859,252 units, up from 1,748,314 units shipped during the same period in 2013. The year-to-date total for heat pump shipments increased 17.1 percent, to 1,014,646 units, up from 866,557 units shipped during the same period in 2013.